‘To be or not to be, that is the question’. Read Hamlet’s famous soliloquy by Shakespeare below, along with a modern translation and explanation of what ‘To be or not to be’ is about. We’ve also pulled together a bunch of facts about the famous soliloquy, and have the 5 most famous film performances of ‘to be or not to be’. 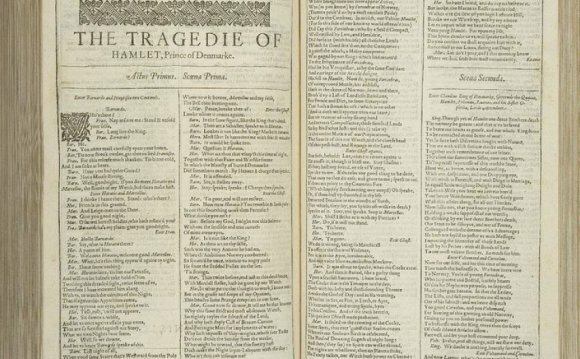 ‘To be or not to be’ is the most famous soliloquy in the works of Shakespeare – probably, even, the most famous soliloquy anywhere. That is partly because the opening words are so interesting, memorable and intriguing but also because Shakespeare ranges around several cultures and practices to borrow the language for his images, and because he’s dealing here with profound concepts, putting complex philosophical ideas into the mouth of a character on a stage, communicating with an audience with a wide range of educational levels. The question for him was whether to continue to exist or not – whether it was more noble to suffer the slings and arrows of an unbearable situation, or to declare war on the sea of troubles that afflict one, and by opposing them, end them. To die. He pondered the prospect. To sleep – as simple as that. And with that sleep we end the heartaches and the thousand natural miseries that human beings have to endure. It’s an end that we would all ardently hope for. To die. To sleep. To sleep. Perhaps to dream. Yes, that was the problem, because in that sleep of death the dreams we might have when we have shed this mortal body must make us pause. That’s the consideration that creates the calamity of such a long life. Because, who would tolerate the whips and scorns of time; the tyrant’s offences against us; the contempt of proud men; the pain of rejected love; the insolence of officious authority; and the advantage that the worst people take of the best, when one could just release oneself with a naked blade? Who would carry this load, sweating and grunting under the burden of a weary life if it weren’t for the dread of the after life – that unexplored country from whose border no traveller returns? That’s the thing that confounds us and makes us put up with those evils that we know rather than hurry to others that we don’t know about. So thinking about it makes cowards of us all, and it follows that the first impulse to end our life is obscured by reflecting on it. And great and important plans are diluted to the point where we don’t do anything. What do you think of the modern translation of Hamlet’s ‘To be or not to be’ soliloquy above? Let us know in the comments below. The first six words establish a balance. There is a direct opposition – to be, or not to be. Hamlet is thinking about life and death and pondering a state of being versus a state of not being – being alive and being dead. The balance continues with a consideration of the way one deals with life and death. Life is a lack of power: the living are at the mercy of the blows of outrageous fortune. The only action one can take against the things he lists among those blows is to end one’s life. That’s the only way of opposing them. Death is therefore empowering: killing oneself is a way of taking action, taking up arms, opposing and defeating the slings and arrows of outrageous fortune. Living is a passive state; dying is an active state. But in order to reach the condition of death one has to take action in life – charge fully armed against Fortune – so the whole proposition is circular and hopeless because one does not really have the power of action in life. Death is something desirable – devoutly to be wished, a consummation – a perfect closure. It’s nothing more than a sleep. But there’s a catch, which Hamlet calls a rub. A ‘rub’ is a bowls term meaning an obstacle on the bowls lawn that diverts the bowl, so the fear of the life hereafter is the obstacle that makes us pause and perhaps change the direction of our thinking. We don’t control our dreams so what dreams may come in that sleep in which we have shuffled off all the fuss and bother of life? He uses the word ‘coil, ’ which is an Elizabethan word for a big fuss, such as there may be in the preparations for a party or a wedding – a lot of things going on and a lot of rushing about. With that thought Hamlet stops to reconsider. What will happen when we have discarded all the hustle and bustle of life? The problem with the proposition is that life after death is unknown and could be worse than life. It’s a very frightening thought. That’s the obstacle on the lawn and it diverts his thoughts to another direction.